Voight Contracting / Country Roads Ag-Hire undertakes mechanical Grass Seeding & Fertilising predominantly for Civil and Landscaping firms, where various types of Grass & Fertilisers are applied per site specifications. We can also provide recommendations on blends giving consideration to site and soil conditions to ensure maximum coverage and success rates. Grass seeding and fertilising utilising mechanical seed drills is more cost-effective, compared to other seeding methods, and offers optimal success in all conditions. Mechanical Drill seeding (grass seeding and fertilising) is performed by using a specialised tractor attachment called a seed drill, which opens a furrow in the soil’s surface, places seed at the required depth, then covers the seed. The rate of application as well as the depth are variable and can be adjusted to suit your site’s requirements. Often providing soil preparation with the amelioration of other materials such as aglime, gypsum and/or fertilisers, Voight Contracting provide a single-point solution for your site, as we can provide soil conditioning materials (such as lime, bentonite, gypsum, dolomite) in bulk quantities, spread and incorporate these materials into the soil’s surface, then grass seed and fertilise the soil so that all works are covered from start to finish. 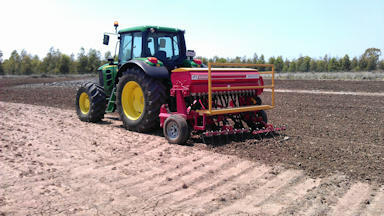 Our seed drills have accurate meters to control the delivery of seed, calibrated by the operator to your specifications. Many types of grass can be seeded, including millet, rhodes, couch, bluegrass, buffalo, and rye – to name just a few.